No one ever wants to get sick, and no one plans for a cold or the flu to wreak havoc on their schedule, let alone their immune system. When the weather gets colder, we all huddle inside, creating a perfect storm for bacteria and illness to multiply. 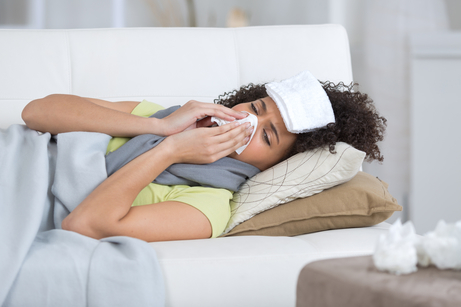 The flu virus actually thrives in cold air, encouraging flu season to continue on until warmer weather arrives; because of this, colds can spread around the workplace like lightning during the winter months. Believe it or not, your grandma was right: adding extra layers and making sure you stay nice and cozy during the winter really does help you avoid getting sick. There’s actual evidence that supports the idea that shivering can lower your body’s immune response, lessening its ability to fight off a cold or the flu. Also, it’s been proven that breathing in chilly air through your nasal passages affects their ability to combat germs. Additionally, if you let your feet get cold, you’re more likely to get sick. So bundle up, put on an extra pair of socks, and don’t be afraid to wrap that scarf around your face when you head outdoors. A great workout— or even moderate exercise a few times per week— can increase the number of T-cells in your body, which are designed to fight off infection. In fact, 65-year-olds who work out regularly have been shown to produce the same number of T-cells as a 30-year-old person. Increased blood flow can also help prevent sickness, giving you and your coworkers yet another reason to make exercise a priority. The flipside of this? Be careful you aren’t working out too much. Putting extra stress on your body will actually lower your immune system! Find a balance that works for you, and help fight a cold by breaking a sweat. Also important? Don’t forget to rehydrate after your workout! Drinking plenty of water is another way to keep your immune system firing on all cylinders. While we know that many of the germs that cause colds or the flu are spread through the air with all that sneezing and coughing, we can pick up loads of viruses and bacteria on our hands, which can cause you to get sick just as easily. Wash your hands whenever you get the chance, and make sure you are using proper handwashing technique. In the midst of cold and flu season, it’s also important to avoid touching your face. Your eyes, nose, and mouth pick up germs at an alarming rate when you touch them with dirty hands. Regular hand washing, and keeping your hands away from your face will reduce your risk of getting sick greatly this winter. You’ll want to stock up on plenty of paper towels and soap for the winter so your coworkers can wash their hands as often as possible! When you or a family member gets sick, you may think to wipe down doorknobs or counter-tops to help prevent the spread of germs, but we rarely think to clean off our smartphones, even though they come in contact with our hands and face all too regularly. On a non-porous surface like your iPhone screen, the flu virus can remain active for several hours, and dangerous bacteria like MRSA -a sometimes deadly staph infection- can live on your phone for as long as 8 or 9 days. Fortunately, there are methods available to sanitize your phone so that you stay healthy without damaging your phone or its screen. While it may seem counterproductive to try and prevent a spike in sick days by encouraging your employees to take a sick day, it’s far better than the alternative. One sick employee coming in to work can quickly lead to a workplace epidemic, so give them the time off they need to recover before they come back to the office. As a general guideline, your employees should wait 24 hours after a fever subsides or one day after the start of a round of antibiotics before they are no longer considered contagious. While they may fall temporarily behind, giving them the time they need to get better not only keeps others from getting sick, but your employees will return rested and ready to get back to work, increasing their overall productivity. Recent studies have shown that 50% of the surfaces in classrooms contain the flu virus during the winter months, and offices aren’t much better. Countertops, desks, keyboards, phones, doorknobs, and light switches are all known surfaces that harbor countless germs, and they should be disinfected regularly to prevent the spread of illness. Consistent, routine cleaning of these surfaces will help keep this to a minimum. Just one sick coworker can quickly pass around a head cold to the entire office if they grab the handle of the refrigerator at lunchtime or use another employee’s phone or keyboard. In order for your office to truly prevent the spread germs and illness, you must move beyond cleaning the standard surfaces. The office kitchen, fridge, microwave, floors, and other hard surfaces should also be frequently cleaned and properly sanitized with antibacterial and antiviral cleaners. The common cold and the flu are most contagious before most symptoms start to appear, so you won’t want to wait for the first sign of sickness to sanitize. While this level of deep cleaning may seem daunting, we are here to help. At ServiceMaster Clean, we want to help keep you and your business running smoothly this winter. Making sure you stay healthy by hiring the services of a highly trained professional cleaning company will kill germs and viruses before they can impact your workplace. Contact us today to see how we can make your business beautifully clean and germ-free.